Application of Industrial Engineering tools and techniques in shop floor has become essential to manage garment manufacturing. I don't need to mention that requirement of Industrial Engineering (IE) professionals is growing day by day. More and more garment manufacturing companies are hiring engineers and establishing IE department. In such scenario young engineers and would be industrial engineers need a complete guide for job interview preparation. Getting an IE job is not difficult but getting the job in a good company required showing your competence and in-depth subject knowledge. To crack job interviews job seekers need to know what questions they are going to be asked by interviewers. And most appropriate answers to those questions. To fulfill the requirement, I had taken a project six months ago to write one extensive job interview preparation guide book. And now that book is almost completed. I expecting to launch this eBook in coming week. Following one is the cover page of the eBook. I am very much exited to bring this eBook to your hand. This eBook is exclusively made for you, who wants to choose IE as career and looking for a change in Industrial Engineering job. The Book has been Released. Buy your copy. How this eBook is created? Here is the brief note on how this eBook is created. During my visits to the client factories, I observed industrial engineers to prepare for job interviews. They seek help from colleagues and seniors for what all technical questions they would be asked by interviewers. I remembered that the same thing happened in my earlier career, when I was preparing for the job interviews. So, I planned to write one guide book with frequently asked questions and write answers of those questions. 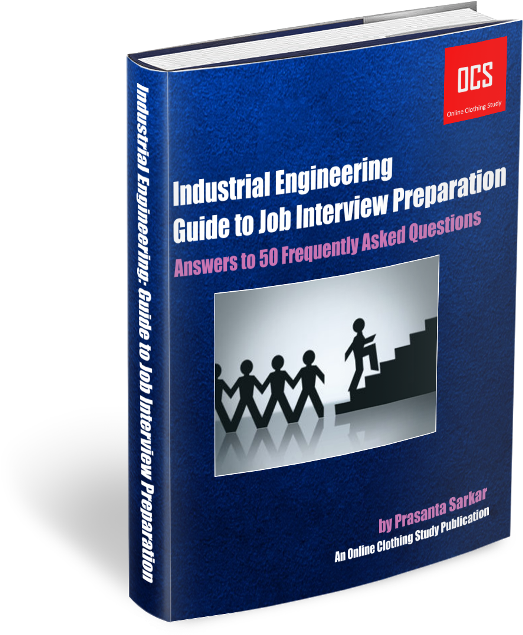 To bring thing this book to you, initially, frequently asked questions in industrial engineering job interviews are collected from my colleagues and friends who are currently working in Industrial engineering in garment factories. Later, technical questions those are commonly asked in industrial engineering job interviews are collected through online questionnaire to gain wider understanding of the interview questions. I have received 200+ questions from online survey. Those questions helped me to shape this eBook with common questions. Thanks to all who had participated in the online survey and sent me list of technical questions on industrial engineering. You will be informed when this eBook would be launched.